Are you into ebooks? Always looking for new authors? 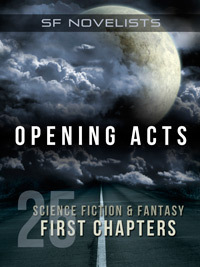 SF Novelists proudly offers you OPENING ACTS, a free ebook presenting twenty-five first chapters across the spectrum of science fiction and fantasy. Twenty-five tastes, to tempt your appetite for adventure...to lure you into unknown worlds...and give you something new to read.